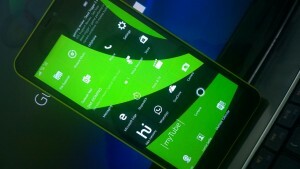 Windows 10 Mobile review: Should you update or not? 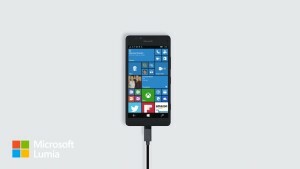 The Ultimate Review Of Windows 10 Mobile: Update Or Not? Now when Windows 10 Mobile is officially announced and its good time to check how it works. Now selected older running Windows Phone 8.1 are getting the update to Windows 10 Mobile so it is time to make a decision: update or not. Historically looking back on previous versions of Windows for phones I always have had an impression that Microsoft have never been working fast enough to develop this system. It took Microsoft around 1.5 year between Windows Phone 8 and 8.1. The other problem was compatibility. Windows 7 was a new beginning after era of Windows Mobile, then Windows Phone 8 was another new beginning as none of older devices were able to update to newer version. Now it seems Windows 10 is another new era as only handful of devices will update and it might be many new functions will be disabled on cheaper devices. I can hear voices complaining that more and more features are missing from Windows 10, but I see it as an advantage. OS is losing functions that are not really necessary, like reading QR codes, which can be easily added if needed by proper apps. There is no deep integration with social media apps like Windows 7 and 8 used to have, but that is what owners of this networks want. Especially if they want to easily update their services and add new features. We can see Windows 10 Mobile as a rapidly changing system with monthly or every second month cycle of updates. That confirms Microsoft plans to develop Windows as a service that constantly changes and evolves and not having new major update once in a long time. There is another confirmation that it will happen as new updates are arriving directly from Microsoft and mobile carriers are not involved (stopping) any of them. It should give users and developers two great values – faster updates and very minimal defragmentation of market. One of the biggest changes from the technical point of view is OneCore. That’s the heart of the system, which is identical with Desktop Windows 10. Both systems are similar like never ever before. It is not only look and feel of tiles, menus and colours it is as well architecture of both systems. That is a massive advantage and unseen nowhere else development. First of all developers can easily create one app and that app will run on mobile, tablet, desktop, tv, xbox and whatever kind of device sooner or later will be on the market (as long as it has Windows 10 on board). No need to create variations of the same apps, developers will save time and money and work quicker on newer updates. There is no need to buy the same game on PC and then on mobile. I absolutely love to play my game in the morning on my mobile, on the way to work, then continue on my tablet when I have a break and then play in the evening on my laptop. All synchronising in the background without any effort on my side. It doesn’t stop here, all my documents, contacts, saved websites, emails, pictures, music everything syncs. I had never felt like I need to connect my mobile to my laptop with a cable to transfer anything. No point. It’s all done, automatically. That’s feature that no one on the market has introduced, just yet. I wasn’t really sure how to bite it until I tried myself, at home. It is designed to help with work. People are more and more mobile and more often they work on the go. Having powerful computer in your pocket is very often a great opportunity that is not used. We do have mobiles so powerful that we can do most of our work done only using them. This is where Continuum comes in. Just connect your phone to a big screen, might be a TV, connect keyboard and mouse, viola – you have a PC. Well, so far it is just a handful of apps working like Office, Mail, Edge, Photos, Facebook, Cortana, but for many of you it might ring a bell. Isn’t all you might be using in your work, isn’t it? Microsoft already made a lot of effort to make Continuum experience as close to a full PC as possible. When I connected my mobile I saw straight away familiar desktop, task bar and start menu like I see on my laptop. I’m sure we will see this rapidly upgrading and adding more options. Question is how useful it really is. If I had to go to conference and work on my articles I would be just fine with Continuum only. There is no win32 apps at all in this so I wouldn’t work on Photoshop. 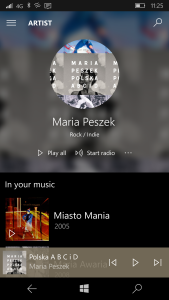 New Windows brings to mobiles third design version of tiles/screen (not available on PC for some reason). You can choose your tiles to have a semi-transparent colour and full screen background in the back, you can choose previous tiles as well, picture within the tiles and black/white background or old fashion solid colour. More options to customise look of your mobile is always welcome. It’s not always easy to pick up right background and match it with tiles colour but when I do it looks amazing. Screen with semi-transparent tiles looks very light and modern, everything is very flawless and information on the tiles are more frequent then they used to be in Windows 8.1. I’m happy that unique accent colour is still present. It keeps it all in one consistent theme across the whole system. 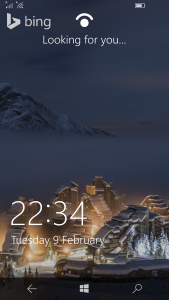 Pressing magnifying glass brings Cortana which now shows half black and half white, not a great design I’m afraid. Press and hold an arrow and you will be in Task Manager, on smaller screen they will be in a single row but on Lumia 950XL they are in two rows. Action Centre is a bit richer now. Single line of 4 or 5 toggles can be easily expanded to give you much more options. I love addition of ‘Flash Light’ over there and ‘New Note’ too. 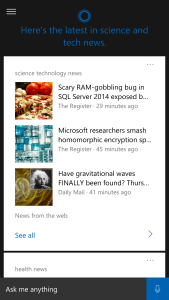 There is an option for Actionable Notifications in Windows 10 mobile. Whenever you got a new text message, pick up your phone, screen goes on itself, drag the notification down and input box will show, type a message in and send. All without unlocking screen or opening any app. Hopefully more developers will include it in their apps soon (I’m talking to you Whatsapp). Holding Start Button will bring screen half way down, leaving top screen blank. That should compensate one hand navigation, in situations when you are not able to rich top of the screen with your thumb. Unfortunately, it is a very poor replacement of great design principles of Windows Phone 7 where all actionable icons and elements where simply located on the bottom of the screen, always there easy to reach. Going deeper into system is disappointing to old fans. Consistency and distinctive navigation is gone. Sometimes there is pivot menu, sometimes few icons on the bottom of the screen, sometimes hamburger menu on the farther position from your fingers. There is no consistency with alphabet picker too. In most of the cases pressing on letter A will bring you all alphabet fit to the screen in few rows, but in some apps it will be scroll list of letters in a single row. Sometimes alphabet will be white, other times blue. I’m happy with new Settings Menu. It looks exactly like PC version. All options nicely grouped in logical folders, there is a search box to quickly jump to option you look for. By the way, search is a bit a mess at the moment. It doesn’t work like it does on PC, bringing you all you have in one place, like your documents, apps, or system settings etc. Search will only look online and sometimes bringing you apps you have installed. 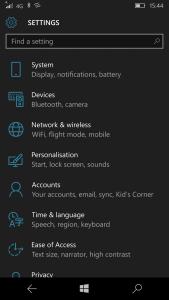 No contacts search, you have to go to People app, no documents search, go to your OneDrive or Files, no system settings either, use search box in the settings app. I hope this will change, but most likely only in RedStone builds (next major versions of Windows 10). All search boxes are really ugly and completely misplaced. Always on the top of the screen, always in thick white frame. Cortana has a few more options now, like finally ‘Send Email’, she can advise you on public transport if you need to get somewhere (Works in London quite well). There is option to track your packages, but not for Royal Mail, she can provide you with conversions of miles, kilograms, pounds and Euro’s, ask Uber to get a ride. It is one of the most important things in mobile for me. That’s the main way to interact with most of apps and many aspects of the system. First there is a Microphone icon to simply say what you want to write. You can move around whole keyboard if there is need for it. You can change size of it (I use it in smaller size) .There is a little dot next to letter Z which works like a joystick to move around cursor in 4 directions, it has use when you have a long text and you need to move to some exact spot somewhere in the middle. Big upgrade if your device comes with Windows Hello (Lumia 950 and 950XL). Apart that nothing new. There is still clock as it was, few icons with notifications on the bottom and you can choose one app to show more detailed information. There is no need for actionable widgets as it all can be inserted into Action Centre. Windows 10 mobile comes with default apps and this time around they are separated from Core and are very frequently updated. That includes even Store and Messaging apps. That is a good direction. It’s better to have them updated and have new functions added then have apps integrated into system (more stable and more energy efficient would be though) in rapidly changing market. I can’t express how much more I prefer new mail app. It looks and works exactly like PC version. Familiar menu, swipe to delete or flag, choose different sort, unread or all. Much more options and even customisations. There is a few things to fix though. It can be confusing to have Hamburger menu on one side of the screen and then 3 dots on the other side. Both holding few more options. Funny enough there is blank space on the bottom of the screen where hamburger could go if it really needs to be, where would be easier to access or 3 dots could hold all the extra options in one place. Another problem is rendering emails. Sometimes email doesn’t fit the screen so I have to scroll around to see it all or there is really thin column of text taking only middle of the screen. There is no big change in design, it still black background and text, there is no ‘View Unread only’. It is nice to see pictures of my contacts next to conversations. There is Skype messaging integration, so you can choose to send a regular text message or Skype message. From the other hand Skype Video is built into Phone app. Unfortunately, that is extremely buggy and even though I saw many updates coming, there is no change in Skype services. Notifications won’t show if it is a Skype message or call, no live tile update either, there is no other extra features on top of plain text. No attaching pictures, no video message, no nothing. Messages will sync with your desktop messaging app on your PC, but only Skype part of them. I can see huge potential to make a really rich and powerful texting experience here, but so far it is only disappointment that I could only switch off to not waste battery on. It’s surprising that Microsoft decided to add this integration in such a raw state. It is one of the apps I’m avoiding. There is nothing in there. Contact pictures are now circle rather than square. 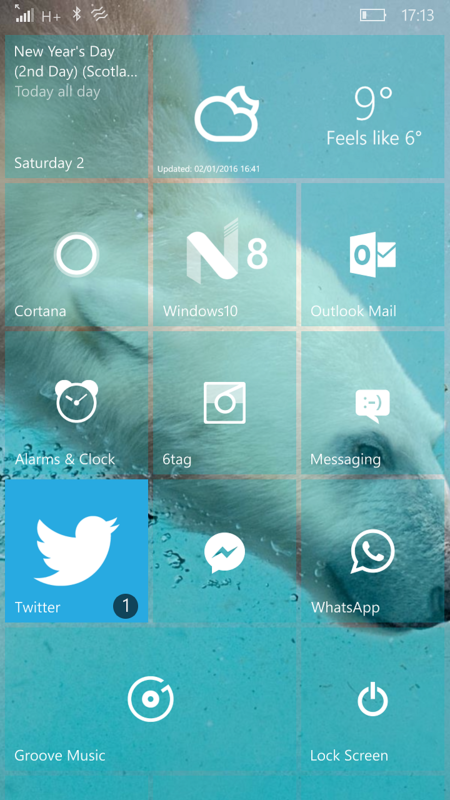 Many people do like it, but in my opinion it is striking contradiction to square tiles on the screen. You can still find ‘What’s New’ section, but it is a very frustrating way of checking Facebook feed. Pressing on anything will take you to your Facebook app or to Facebook mobile page. I can’t see any reason to use this view. You might add Twitter as well to this feed, but no LinkedIn or any other of many social sites. ‘What’s New’ won’t show new messages or emails from your contacts like it used to be in Windows Phone 7. That’s my favourite app. As well like previous apps it is exact copy of desktop version. Consistent design and icons. Mixed view with month and agenda, option to switch to other any possible view. Week view shows month preview as well. Plus, weather forecast on each day. Swiping calendar will switch to next month. As outlook mail you can choose white or black skin, it can be automatically as well accordingly to your phone theme. It is a really good and fast web browser. It has all your favourites and reading list from your desktop, tab view, address bar is easy to reach, on the bottom of the screen (thankfully). It misses a very unique option that desktop version has which is a drawing on pages. There is no more ‘Here Maps’ and they still are here. What does it mean? Default map app is now simply ‘Maps’ by Microsoft, although data that feeds the app is still from ‘Here’ (now I believe belongs to car consortium as Nokia sold this department). Nothing of a surprise in there. GPS locking is very fast, map offers few different views like aerial, angled, road, 3D elements in big cities, traffic info, street view (called streetside), inside buildings maps too and of course the best of all simple and free off-line maps without any hassle. After many complains from Insiders and thousands of feedback notes left this app now works brilliantly. Fast refresh, all pictures from your phone and from your OneDrive are shown in one mix. Although you can opt to not show OneDrive or go to folders and look though one or another source. There are albums like on desktop but not functional just yet. Microsoft promised to enable them soon. We are talking about automatically sorted pictures into folders, very useful if you have some holiday pictures or maybe one night out, app should sort them separately into folders. I do prefer to use Groove Music app and unlimited Pass as it synchronise with my tablet and my Surface (where Spotify is doing the same job but missing touch friendly app on bigger screens). Once more we can find consistent menu comparing to desktop apps. Familiar set up and icons helps to instinctively move around those apps. In Groove app switch between albums, artists, playlists, explore, go to radio, show only offline music, search, show more of an artist. I think everything in here is as it should be, except hamburger menu. I’m finding the most used option there so I have to reach there dozens of times. I would prefer old Zune design, with beautiful modern menu. Some people might miss social integration, to see what your friends are listening, or share playlists etc., but I do not have such a need. Film app is quite simple but completely useful. Switch between your movies and TV shows or files on your phone. Anything you will buy from the Store will automatically show in there. Xbox app is a completely different story. It used to be very simple view of all your games in one place. Now it is a rich and sophisticated social platform that sync with your Xbox One if you have one. You can view through your progress and achievements in all Xbox certificated games, compare with your friends, find Facebook friends that use Xbox as well, send messages too (although I do not understand why it is not integrated with Skype network). Design from the other hand is a terrible mess. Many, many mysterious icons, I do not remember what they all mean so I keep clicking through them. There is home place but as well activity feed, which should be the same for me, and of course Hamburger menu that this time doesn’t give more options it just shows names to the strange icons. And there is no transparent tile as most of apps have. Here we finally getting into some completely different solutions. Windows 10 mobile do have a solid OneDrive app, so you can easily go and check what you have there. Where desktop Windows 10 has no OneDrive app anywhere to be seen. You can only use File Explorer and see folders that are synchronising with your computer. If you opted to not sync them all, you have to go online to OneDrive and look there. That is second of apps that is available on Windows 10 mobile but there is nothing like it on desktop. I find it very useful so I would love to see it on every windows device. 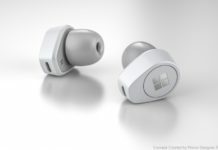 It is simple manager for your wireless connected devices like Bluetooth speakers, headphones or Microsoft Band. There is no need to switch Bluetooth on and then go to settings and connect. You can just use Gadgets app. Pick the device you wish to connect and BT will switch on automatically. App can show you when and where you last time connected with all your gadgets. 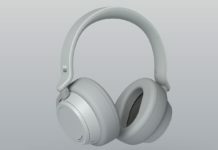 You can customise names and assign to automatically lunch music app when connected with headphones for example. That was very nice surprise when I switched off my phone and just before screen went blank Windows showed me ‘Don’t forget’ and displayed upcoming calendar appointment. Small but really nice touch. The biggest missing option I would say is “Microsoft Pay”. There is no sign of any touchless payment coming to Windows 10 mobile anytime soon. It’s not a big problem in Europe where we have touchless cards in our wallets, but it is another big thing on media and part of marketing picture. You might not need this option ever but it doesn’t look good that there are still things in Windows ecosystem that are lagging behind all the competition on the market. 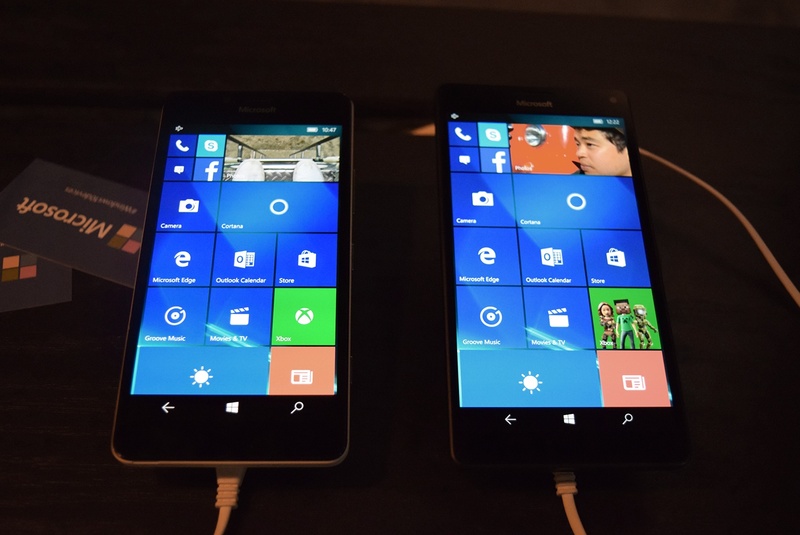 There is no denying that Windows 10 mobile is a big step ahead. It is fluid and fast as Windows used us to be. Tiles are now updating more frequently and flipping around like mad, giving me all information needed. Biometric identification is there as it is a must have option in these days. Even though OS sometimes feels unfinished and there is still design inconsistency what is more important system is much more useful. I do like apps being consistent with desktop apps but I would like to see them being consistent to each other too. 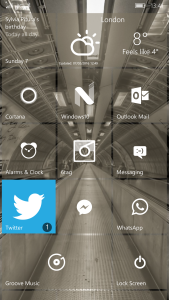 I wish to see all Microsoft apps have a transparent and live tile not only some of them. I am a big fan of all my gadgets closely synchronising my apps, notes, messages, music, videos, pictures, documents, websites. I cannot imagine going back to old times when I had a few different devices with completely different content. I have never connected my phone to the PC by cable and yet I do have one Windows across them all. Cannot imagine a day without my Lumia and Windows 10 mobile.